Saturday, February 16, 2013, Bogota, Columbia. 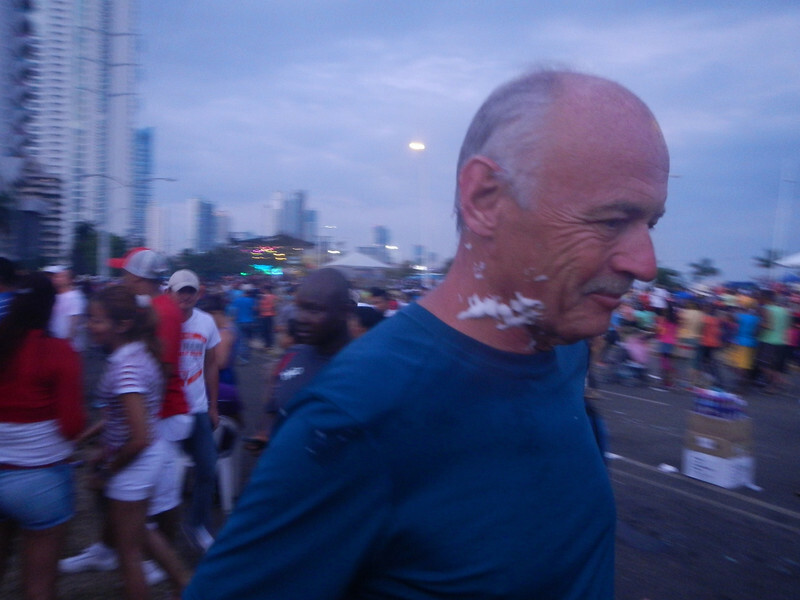 We learned that Carnival is serious business in Panama. In my last post we hoped that on Wednesday, with the festivities over, we could make arrangements to ship the bikes to Columbia and find a battery at the dealer for Deby’s bike. Wrong and wrong. 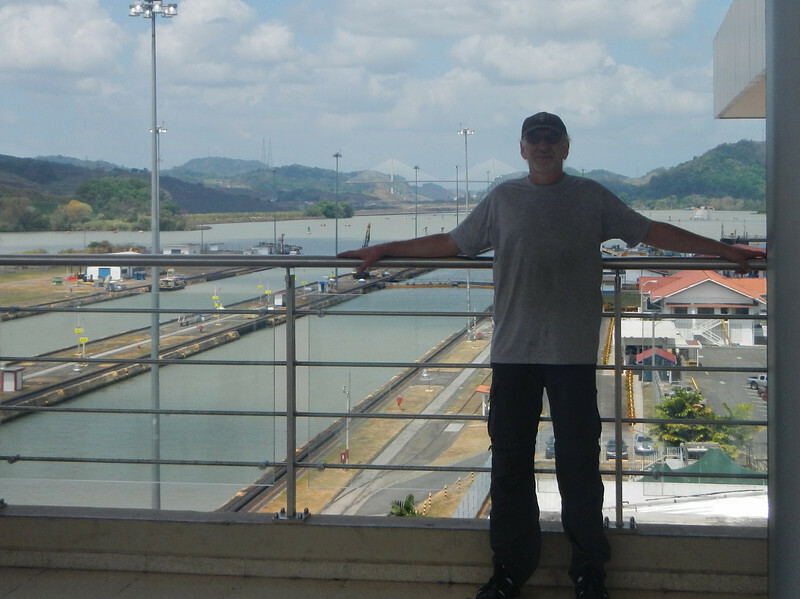 Evidently the day after Carnival is an official holiday to let the hangovers wear off so we found ourselves with another day of hanging around the Country Inn next to the Panama Canal. 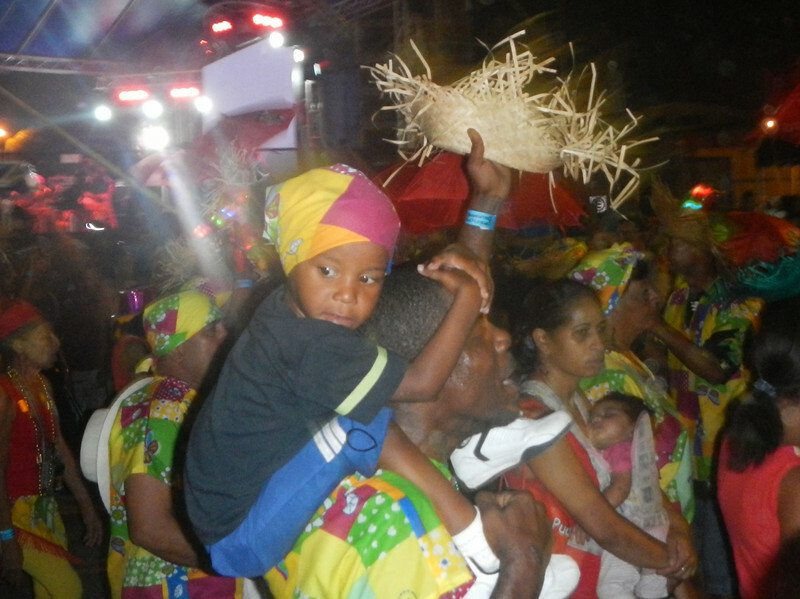 With nothing to do Tuesday night we went back to the Carnival fiesta, this time with camera in hand. 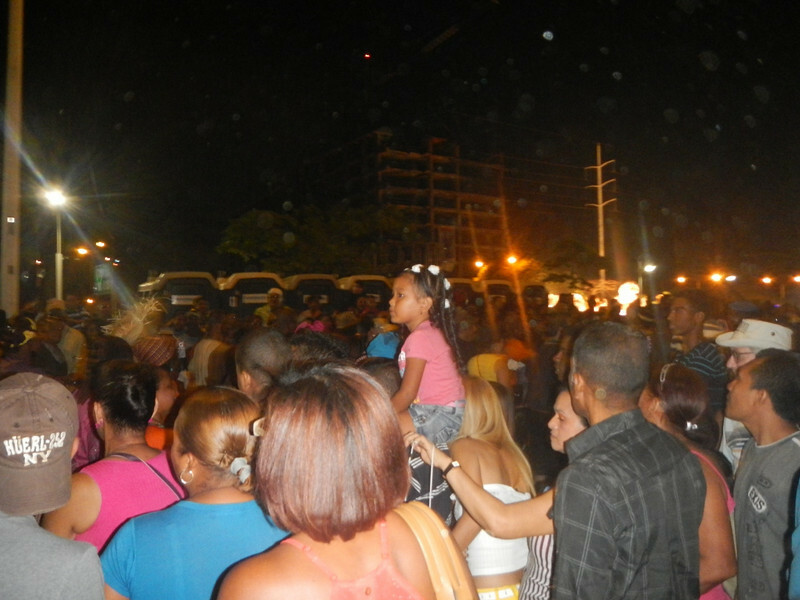 A gazillion people and kids everywhere. 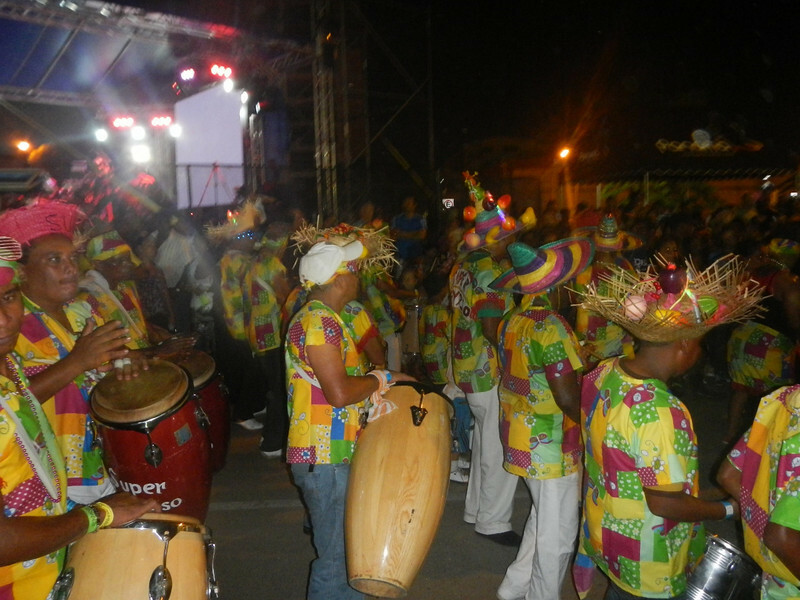 Drum lines of congas! Wow! 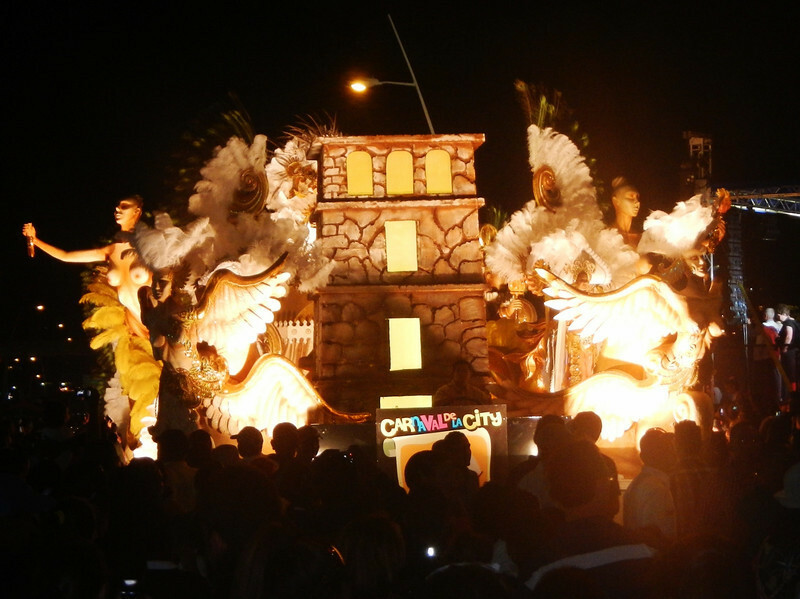 Super elaborate floats – more racy than we would see in the US. Checking out the main stage from off to the side. Needed a good shot of the bass player. Half of the fun for the kids was to run around and spray people with a kind of soapy spray stuff. Even though we all were hit at least once, Michael seemed to be a prime target. 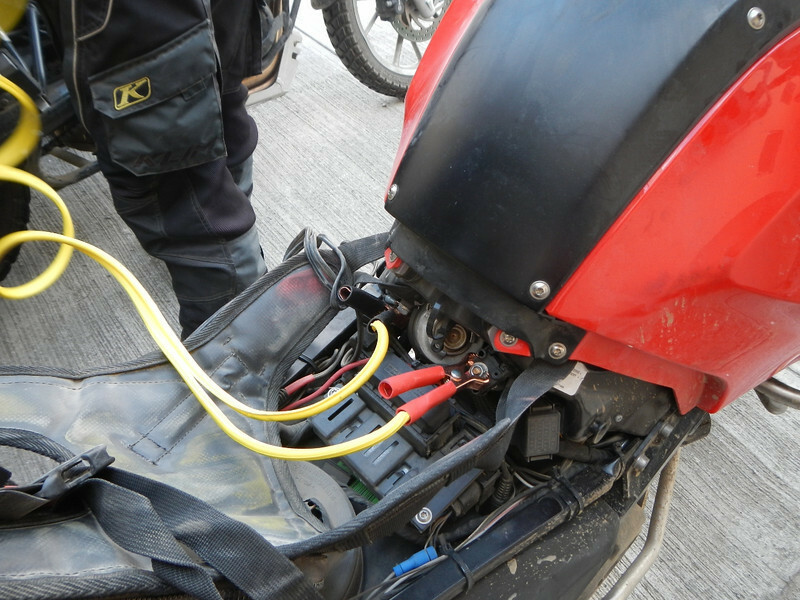 The next day, Wednesday, we got up and rode to the other end of town to the BMW dealer in search of a battery for Deby’s bike. Nope, closed for what I now call “hangover day”. Dejected we turned around and fought traffic and heat on the crowded roads back to the hotel. Out of the corner of my eye I saw a sign for “Casa de las Baterias”. Even I knew enough Spanish to recognize it meant “The House of Batteries”. After a quick U-Turn we stopped and negotiated with sign language a new battery that was an exact fit with only a $50.00 price tag. Done deal. I had the battery in the bike and verified it was working by noon, with another free day ahead of us we decided to ride back to the locks and see if any ships were going through. 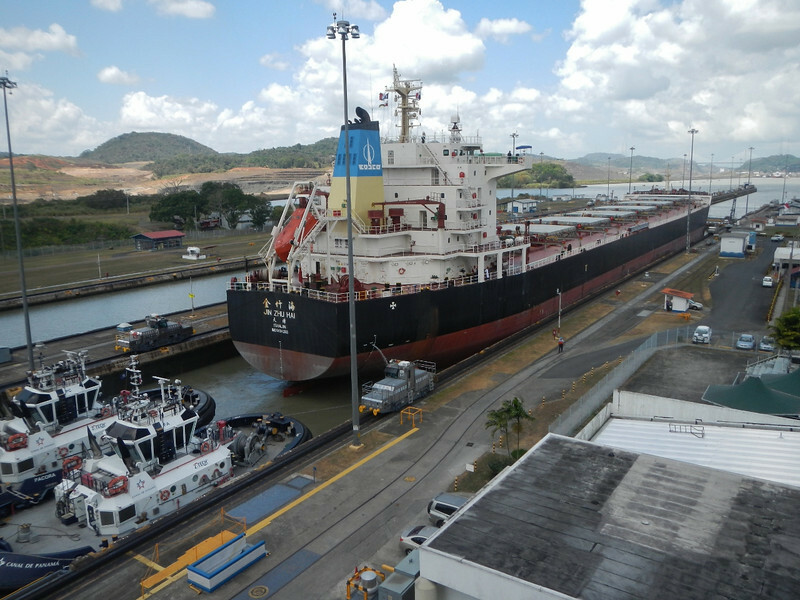 This time luck was with us so we revisited the museum with much lighter crowds and watched a few ships go through the locks. 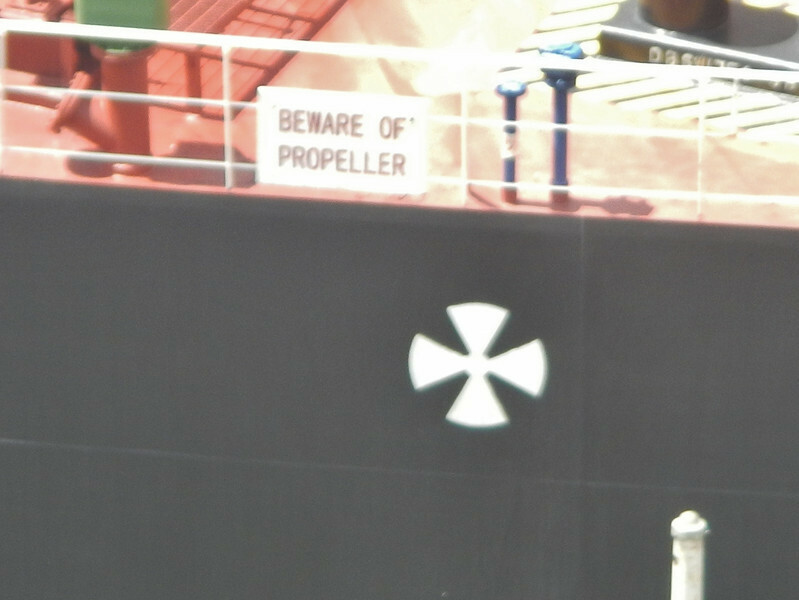 I saw this sign, seems like good advice for any boat. Typical freighter and tug boats in the locks. 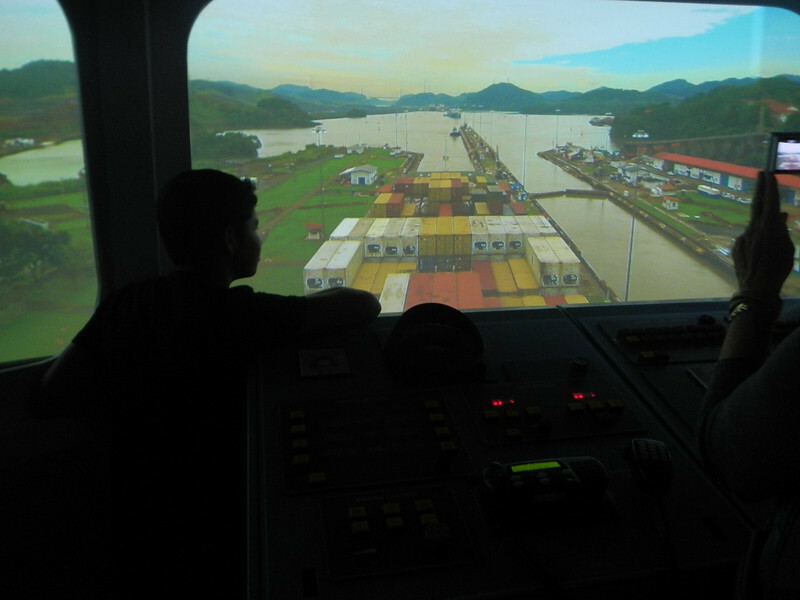 They had a really cool virtual reality mock up of the bridge of a ship going through the locks, we went through at least three times. Deby took a turn at the controls. 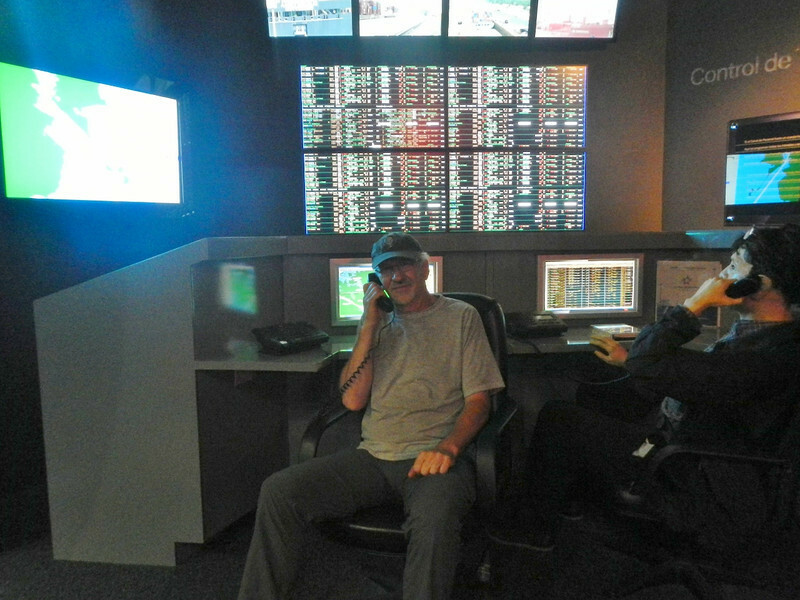 While I sent some commands from the Master Control room. Here is one place where the really big yachts look pretty small. On the way out of the visitor center who should come walking in but our friends Tad and Gaila who we last saw in Nicaragua. What a blast! Deby and Gaila, true adventure motorcycle riders. I’m going to get this posted and save our jump into Colombia for the next entry. 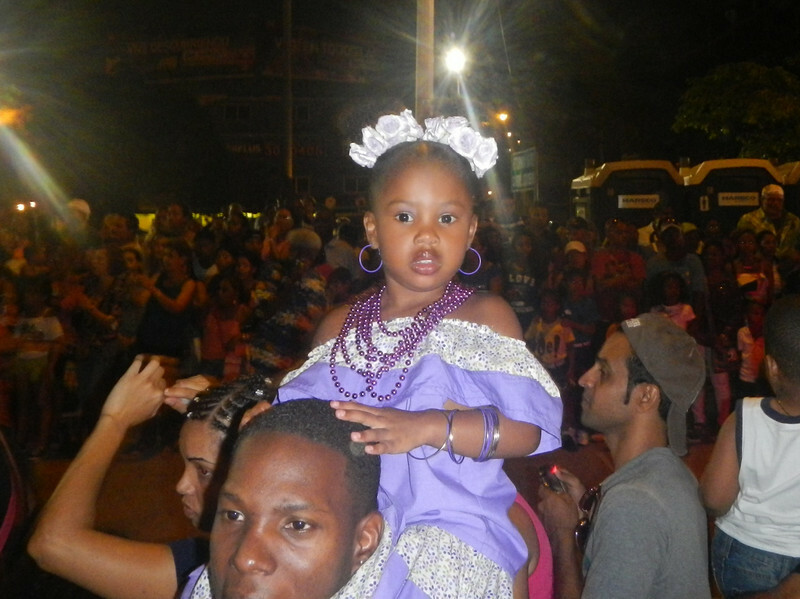 If you want to see more Panama and Carnival pictures click HERE. 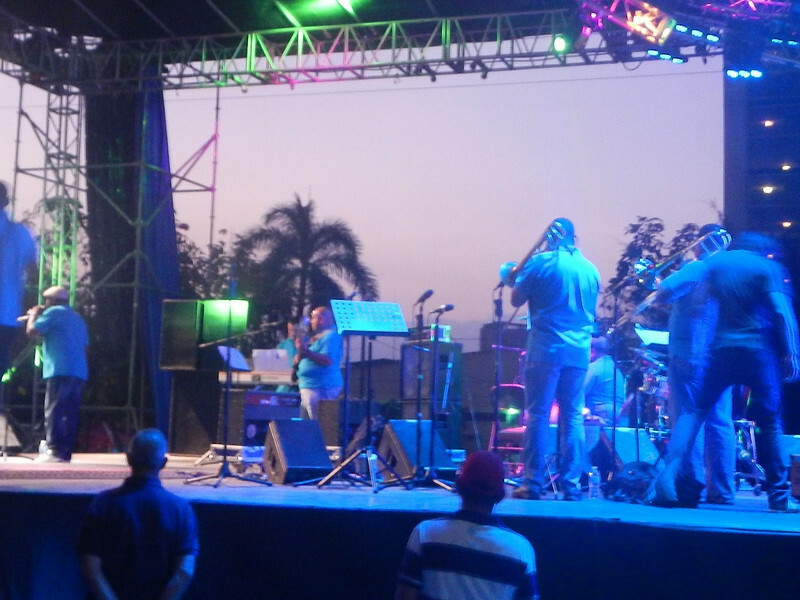 Tuesday, February 12, 2013, Panama City, Panama. Before we left, our friend, Catherine, passed along the advice her mother always gave her, “Watch out for cops!”. For the past 6,000 miles every time Deby or I see a cop we announce in our headsets, “watch for cops”. The TransAmerican Highway in Panama was full of cops everywhere! I’ve never seen anything like it. Motorcycle cops every mile or two for couple hundred miles, from the border to Panama City. I am not exaggerating. This was very unusual after not seeing a speed trap anywhere the whole trip. The first one we came to tagged Michael going 115 in a 80 zone (that’s KPH not MPH). Deby and I were behind him and were not flagged down so we rode a little further ahead and stopped to wait. Shows what good friends we are. It wasn’t long before Michael was putting on his helmet to go on his way, he stopped by us and told us that the cop told him it was a $100.00 fine but for $20.00 it could be fixed on the spot. No sense in arguing that logic so Michael paid the bribe and was on his way. After that the group split into two groups of three with Michael, Deby and I in the first group and Dave, Jim and Keith in the second. When we caught up for a break we found out the second group was pulled over two more times and once the cop asked for Dave’s motorcycle gloves for his bribe. Dave refused and the cop let them move on with a warning. The second time Dave talked the group out of a ticket or fine. Eventually we learned to find a fast taxi and tuck behind it. They seemed to know where all the speed traps were and the unmarked changes in the speed limit. We eventually asked what the deal was with the speed traps and we were told that it was Carnival weekend and there was an emphasis on speeders. 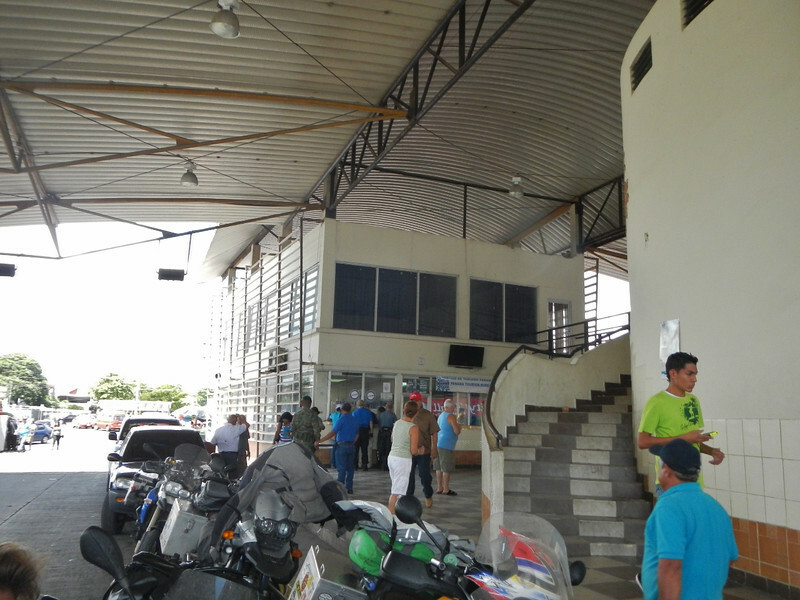 The border crossing into Panama was relatively easy and only took about an hour and a half. I did manage to take a few pictures. 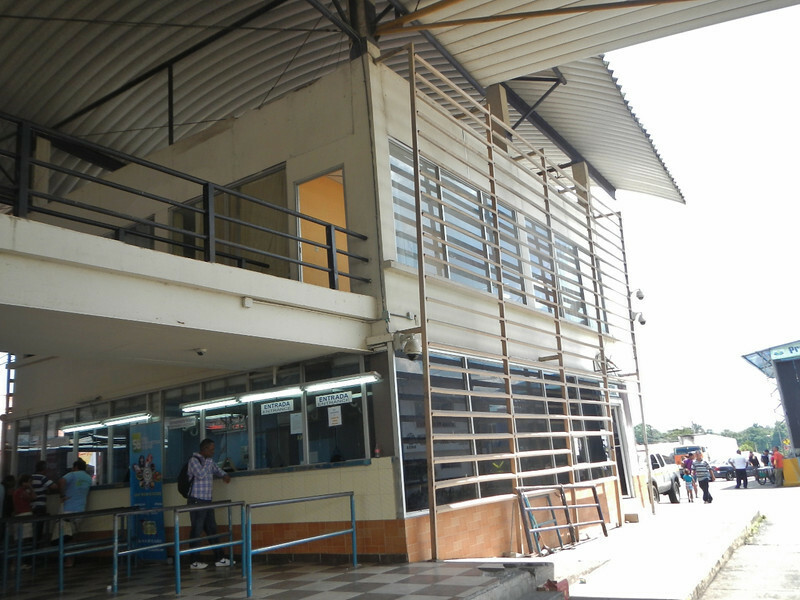 The closest window was passport entry stamp, the door upstairs was to inspect our vehicle insurance and on the far right around the corner was where we paid $1 for fumigation. The window in the background is where we took all that stuff to get the vehicle import permit which we then handed to the guy with the blue hat and shirt who inspected the motorcycles and signed off on them. At least in Panama everything was within a short walk of each other. This woman did a thorough job of fumigating the bikes with some pump spray stuff. It couldn’t have been very toxic because she didn’t wear any protection. 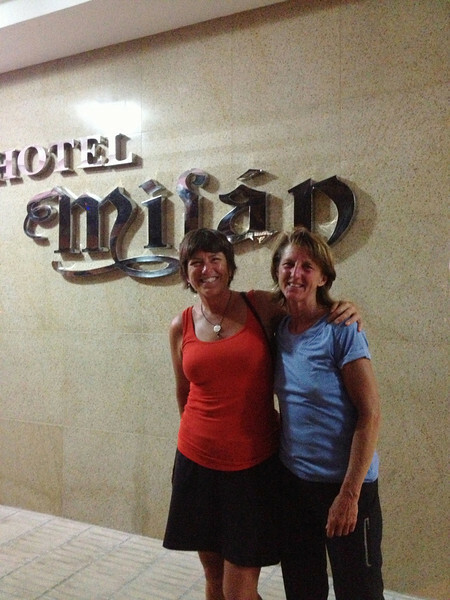 We rode as far as Santiago before we found a pretty decent hotel with a pool to spend the night. 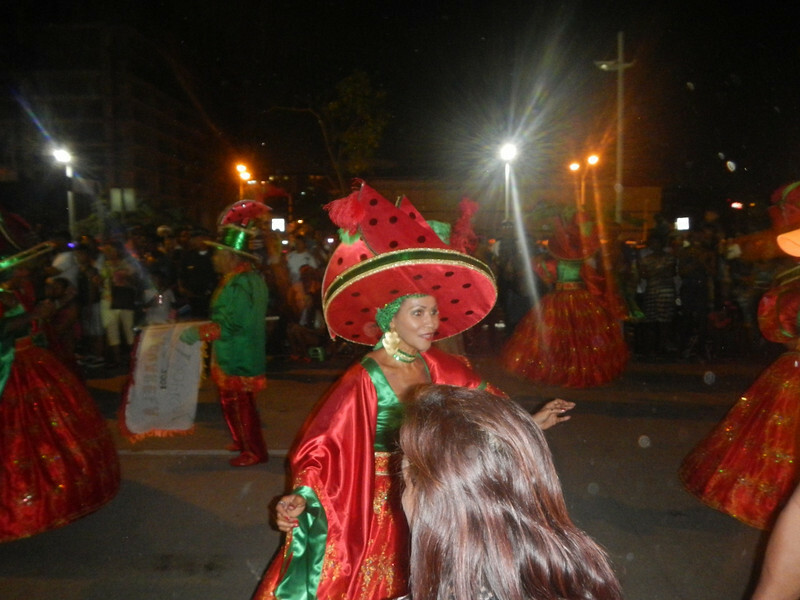 The first two hotels we stopped at were full because of the Carnival festivities that are held in every town. Monday morning we decided to get an early start when we had our first mechanical failure, Deby’s battery was dead. 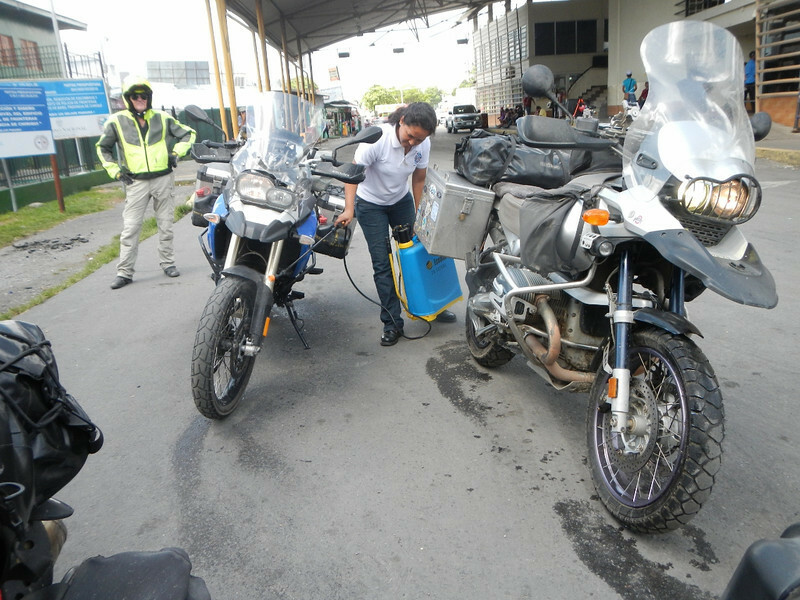 Her bike had been starting a little hard but we hoped to make it to Bogota Columbia to get checked since we have appointments for all the bikes to get serviced there. The best thing to do when a motorcycle doesn’t start is to get as many people as possible standing around looking at it. Then get out the jumper cables, glad Michael had some with him. And varoom! That did the trick, no turning off the 650 until Panama City! We were back on the road in no time dodging cops and drafting taxis. Our strategy worked and despite some close calls we didn’t get pulled over all day. We arrived in Panama City around 2:00 and checked into the Country Inn and Suites, an American style hotel right on the canal in the shadow of the Bridge of Americas. 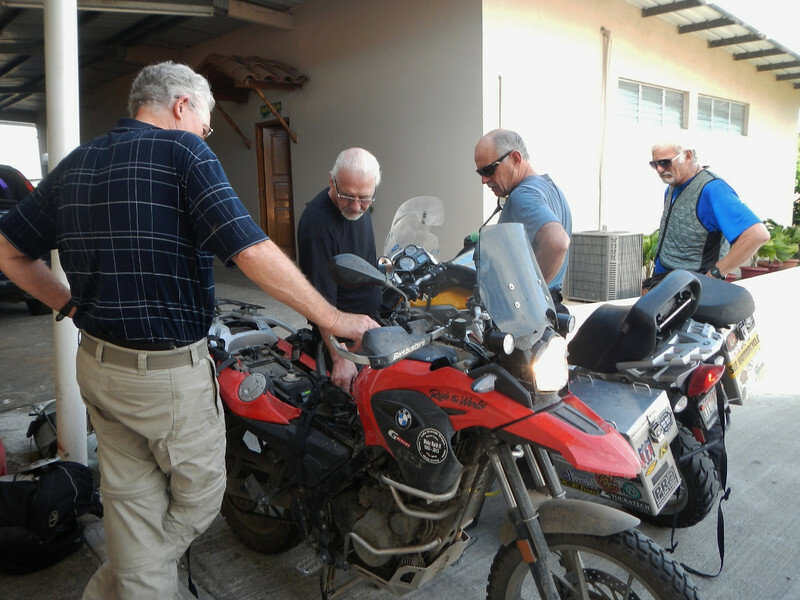 The first order of business was to find a battery for Deby’s bike so I jumped on Deby’s still idling bike and followed Keith and Michael in search of the BMW dealer. We had the very faulty assumption it would be open on Monday, during Carnival. We got totally lost since most of the roads were closed for parades and parties and ended up hiring a cab to lead us to the dealer. He took us on a wild ride through the city and even he got lost, twice, and had to ask for directions only to find the BMW dealer had moved. Eventually after some more asking we found the very nice dealership which, of course, was closed. Between the three of us we figured out from the sign that they were closed for the holiday (duh) and would reopen on Wednesday. Somehow we found our way back to the hotel touring the slums of Panama City in the process. 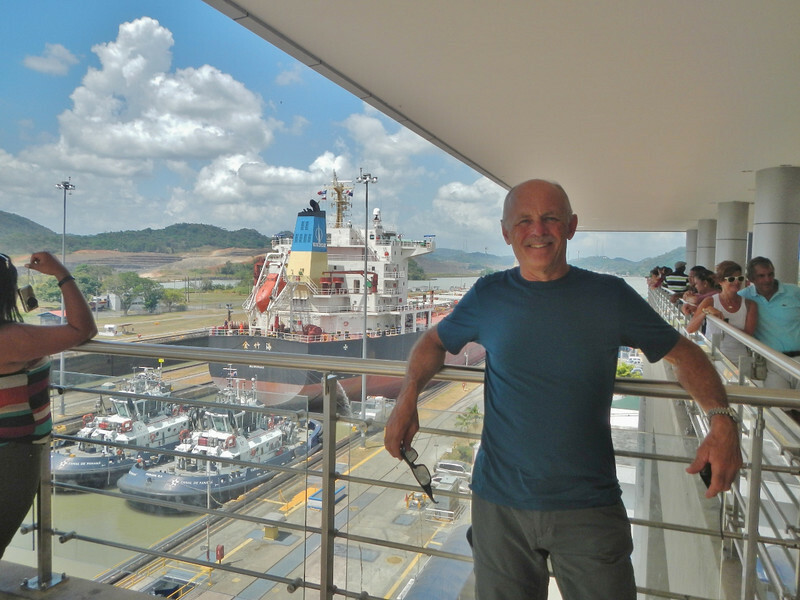 The plan in Panama was for Keith and Jim to investigate a boat for the bikes to Columbia and me and David to look into flying the bikes as airfreight. It became clear that everything was closed until at least Wednesday so we extended our stay at the hotel and declared Tuesday as a free day. Monday night when everyone else settled into their rooms after dinner Michael and I decided to grab a cab and head down to the party. I didn’t bring my camera or anything valuable because I wasn’t sure what to expect so with nothing but a couple twenties in my pocket we ventured into party zone. 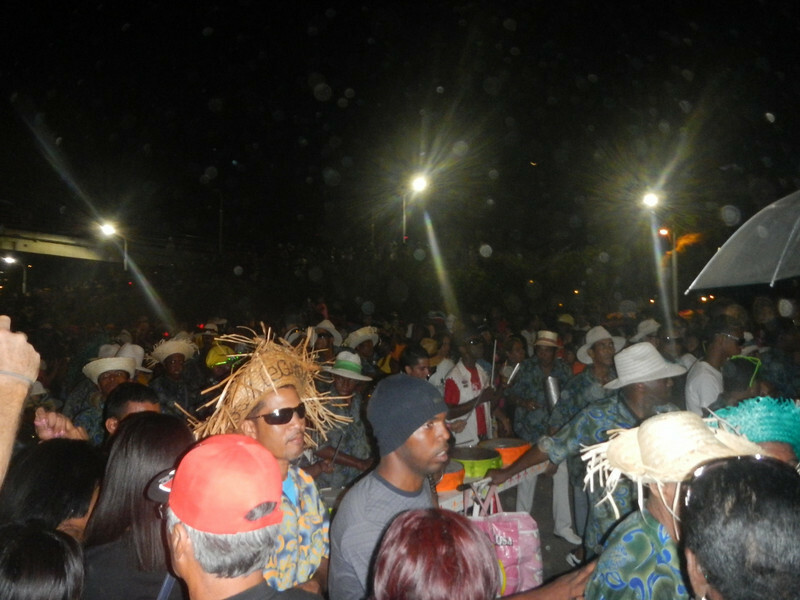 It was loud, crowded, chaotic, zany and fun. We were patted down at the entrance gate but there was not charge. We spent the night going from stage to stage listening to fantastic Latin music, watching a gazillion little kids prank people, and us, with some kind of soapy spray, drank beer and generally had a fun time. 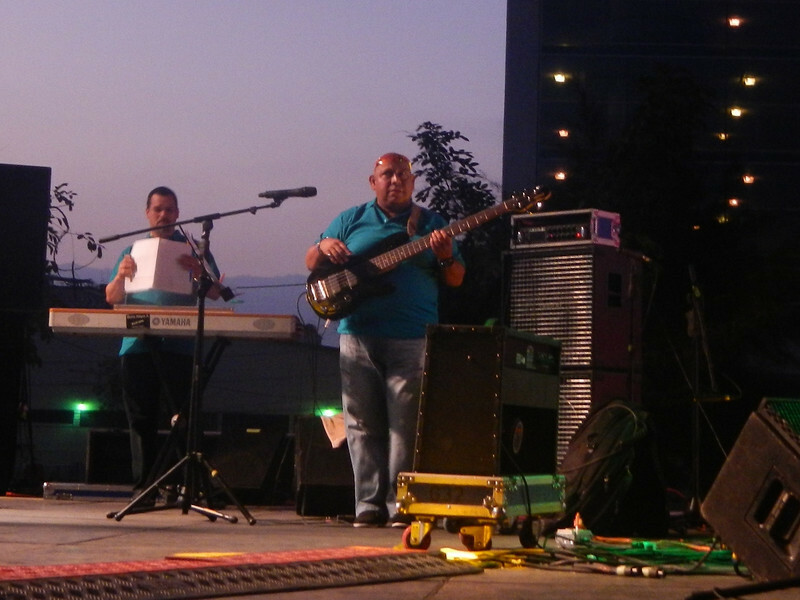 We were standing by the backstage part of the main stage and some guy came to talk to us. He was about our age (old) and wanted to practice his English, which was quite good. I found out he was a musician in the next band and guess what? He was the bass player! An immediate bond was formed and he brought us drinks, gave us his phone number and said if we came into any kind of trouble in Panama, even with the really bad guys, he could help us out because everyone knows him. We stashed his number away, you never know when something like that might come in handy. 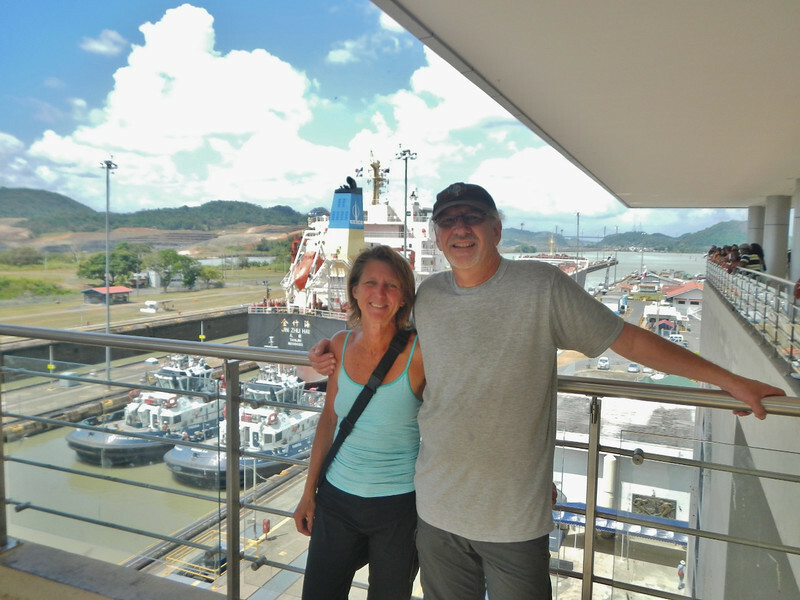 On our day off Deby and I rode two-up on my bike to the Panama Canal visitor center. It was super busy with shoulder to shoulder people. Deby took this picture of me with some of the locks in the background. Only one thing was missing… ships! Nothing, nada, nix and nay. Must be closed for Carnival? 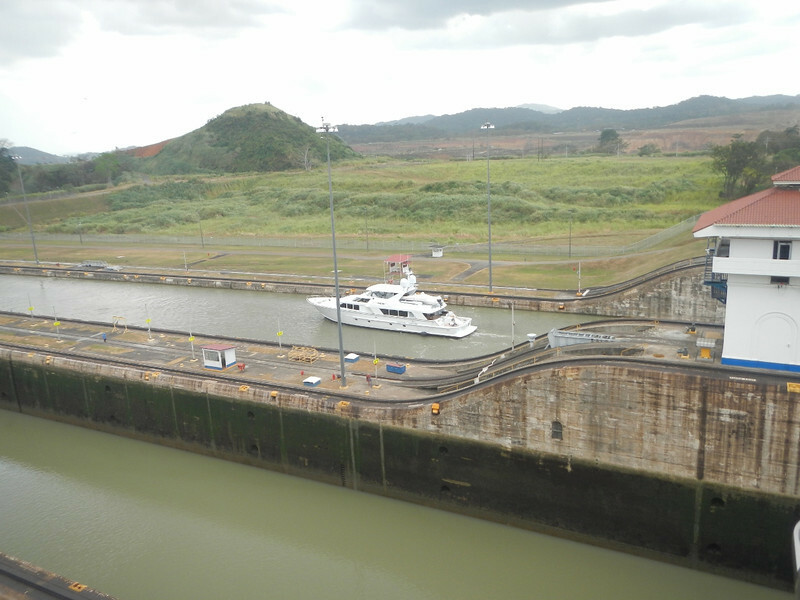 Tomorrow is Wednesday so we will resume our search for passage to Columbia and South America, a battery for Deby’s bike and maybe visit the locks again to look for some actual oceangoing ships. Tonight? I think Deby and I will probably get our party on and check out the last grand finale of Carnival!